Philips (TPVision) OLED 873 features a 65" 4K WRGB OLED TV panel, Philips' P5 "Perfect-Picture" processor, 3-sided Ambilight, HDR10, HLG and HDR10+ (will arrive in Q2 2018), Quad-core Android TV platform with Google Assistant and 16GB of memory. 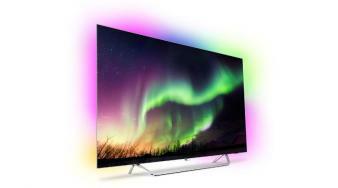 The Philips OLED 873 is now shipping in the UK for £2,700. (note: affiliated link to Amazon).